Vedanta (Devanagari: वेदान्त, Vedānta) initially was connotation for the Upanishads comprising the Brahman Sutras and the Bhagavadgita. There are many schools of Vedanta including the well propagated schools of Advaita Vedanta, Vishishtadvaita, and Dvaita. It is a Sanskrit word meaning “end of knowledge”, a compound of two words “Veda” meaning “Knowledge” and “ Anta” meaning “End”. Its essence is the philosophy of eternal living which leads to “Self- Realization”. Swami Vivekananda in Quotes. Birister Sharma. Retrieved on 19 April 2016. Arthur Schopenhauer in Quotes. Vedanta Institute. Retrieved on 29 November 2013. In the whole world there is no study so beneficial and so elevating as that of Vedanta. He wise man who, by means of concentration on the Self, realizes that ancient, effulgent One, who is hard to be seen, unmanifest, hidden, and who dwells in the buddhi and rests in the body — he, indeed, leaves joy and sorrow far behind. From the Upanishads Divine Quotes. Vedanta Society of Sacramento. Retrieved on 29 November 2013. On the tree of Indian wisdom there is no fairer flower than the Upanishads, and no finer fruit than the Vedanta philosophy. The fundamental idea of the Vedanta system, as most tersely expressed in the words of the Veda, "That art thou" (tat tvam asi), and "I am Brahman"(aham brahma asmi) is the identity of Brahman and the soul. This means that idea of Brahman, that is, the eternal principle of all being, the power which creates all worlds, sustains them and again absorbs them, is identical with the Atman, the self, or the soul ; namely, with that in us which, when we judge rightly, we acknowledge as our own self, as our inner and true essence. This soul in each one of us is not a part of Brahman nor an emanation from him, but it is, fully and entirely, the eternal indivisible Brahman itself. Vedanta is a philosophy taught by the Vedas, the most ancient scriptures of India. Its basic teaching is that our real nature is divine. God, the underlying reality, exists in every being. Religion is therefore a search for self-knowledge, a search for the God within. We should not think of ourselves as needing to be SAVED. We are never LOST. At worst we are living in ignorance of our true nature. Find God. That is the only purpose in life. Pavlick, Robert K. (December 2010). A Gay Epiphany: How Dare You Speak for God?. iUniverse. pp. 223–. ISBN 978-1-4502-8021-1. Medina, Gil (April 2010). Wisdom of a Universe. Dorrance Publishing. pp. 30–. ISBN 978-1-4349-5734-4. Swami Vivekananda Quotes on Vedanta. Swami Vivekananda Quotes Organization. Retrieved on 29 November 2013. You must always remember that the one central ideal of Vedanta is this oneness. There are no two in anything, no two lives, nor even two different kinds of life for the two worlds. Now I will tell you my discovery. All of religion is contained in the Vedanta, that is, in the three stages of the Vedanta philosophy, the Dvaita, Vishishtâdvaita and Advaita; one comes after the other. These are the three stages of spiritual growth in man. Each one is necessary. This is the essential of religion: the Vedanta, applied to the various ethnic customs and creeds of India, is Hinduism. The first stage, i.e. Dvaita, applied to the ideas of the ethnic groups of Europe, is Christianity; as applied to the Semitic groups, Mohammedanism. The Advaita, as applied in its Yoga-perception form, is Buddhism etc. Now by religion is meant the Vedanta; the applications must vary according to the different needs, surroundings, and other circumstances of different nations. You will find that although the philosophy is the same, the Shâktas, Shaivas, etc. apply it each to their own special cult and forms. Now, in your journal write article after article on these three systems, showing their harmony as one following after the other, and at the same time keeping off the ceremonial forms altogether. That is, preach the philosophy, the spiritual part, and let people suit it to their own forms. I wish to write a book on this subject, therefore I wanted the three Bhashyas; but only one volume of the Ramanuja (Bhashya) has reached me as yet. In our country there is only this religion of Vedanta. Compared with the Western civilisation, it may be said, we have hardly got anything else. 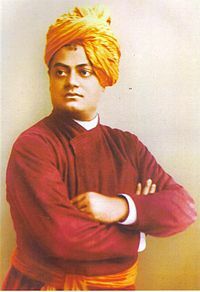 But by the preaching of this universal religion of Vedanta, a religion which gives equal rights to acquire spirituality to men of all creeds and all paths of religious practice, the civilised West would come to know what a wonderful degree of spirituality once developed in India and how that is still existing. Man, therefore, according to the Vedanta philosophy, is the greatest being that is in the universe, and this world of work the best place in it, because only herein is the greatest and the best chance for him to become perfect. Angels or gods, whatever you may call them, have all to become men, if they want to become perfect. This is the great centre, the wonderful poise, and the wonderful opportunity — this human life. The Vedanta recognises no sin, it only recognises error. And the greatest error, says the Vedanta, is to say that you are weak, that you are a sinner, a miserable creature, and that you have no power and you cannot do this and that. Every time you think in that way, you, as it were, rivet one more link in the chain that binds you down, you add one more layer of hypnotism on to your own soul. Therefore, whosoever thinks he is weak is wrong, whosoever thinks he is impure is wrong, and is throwing a bad thought into the world. This we must always bear in mind that in the Vedanta there is no attempt at reconciling the present life — the hypnotised life, this false life which we have assumed — with the ideal; but this false life must go, and the real life which is always existing must manifest itself, must shine out. No man becomes purer and purer, it is a matter of greater manifestation. The veil drops away, and the native purity of the soul begins to manifest itself. Everything is ours already — infinite purity, freedom, love, and power. Vishishtadvaita Vedanta of ramanaujacharyaVedanta Philosophy of Jagadguru Ramanujacharya. Bhakti Yoga Meditation. 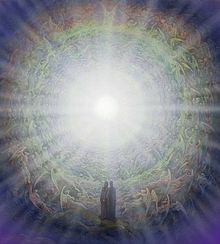 God is one, but with internal differences, represented as the souls and the material creation. God has qualities. He is an ocean of Divine knowledge, bliss, compassion and other unlimited attributes. The world, comprised of the souls and lifeless inert matter, is a part of His being. He is referred to as 'nirgun', without any qualities, but what this indicates is that God is without the 'mayic' qualities of sattva, rajas and tamas. The material creation arose from God, therefore it is not an illusion. Maya is a power of God and established in Him. A soul is an infinitesimal fraction of God, just as a spark is a part of a fire. It remains at one place at a time, whereas God is omnipresent. The soul is ignorant, but God is omniscient and omnipotent. Being a fraction of God, the soul will always remain in existence. The soul could be considered equal to God only with respect to the experience of Divine bliss. The only means for a soul to be liberated from maya is selfless, whole-hearted devotion to God. The soul is an eternal servant of God. To refer to himself as God is a great sin. Dvaita vedanta or dualism.Vedanta Philosophy of Jagadguru Madhvacharya. Bhakti Yoga Meditation. Retrieved on 29 November 2013. If there are scriptural verses that relate to Advaita or non-dual philosophy, they are secondary, not primary... a soul can attain God realization and liberation only through bhakti. Absorb yourself in the love of God. Remain unswervingly on the path recognized by the Vedas and other scriptures. When doing any good action, humbly remember God. He is your everything.